I came across a little piece of positive news for the industry last week. It looks like Italy will be granted its wish in November to have the “Mediterranean diet” declared one of the world’s cultural traditions deserving of protection under an UNESCO World Heritage status. News like this reaffirms what an important role olive oil plays in world health and how many people around the world benefit from its qualities. It may not seem like olive oil needs protecting, but with lawsuits, new USDA regulations and now UNESCO getting into the act, it clearly doesn’t hurt. As always, we encourage you to spread the word. 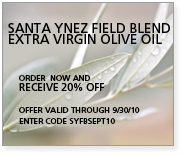 Planning to buy or sell olives in the upcoming new harvest season? Go to The Olive Oil Source Forum to exchange information and business opportunities.